I have updated this Ninja Birthday Party post the best I could. I wrote this post and took the pictures when I started my blog many years ago. That was before I knew anything about blogging, photography and even thought that someone would read the post. 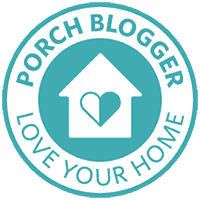 And, wouldn’t you know it, this is one of my top performing posts STILL on the blog! I wanted to make this post as best as I could without having to recreate the entire party. 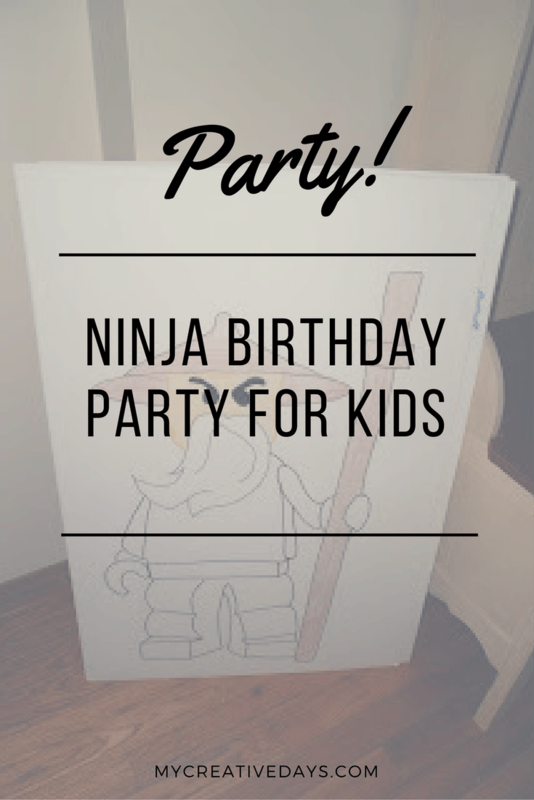 There is a lot of great ideas for a Ninja Birthday Party in this post and we saved so much money by doing the party the way we did so I am happy to keep sharing those ideas with you all! When our son turned nine, he was crazy about LEGO Ninjago. Planning a Ninja Birthday Party back then was not easy. I searched and searched for ideas, but kept coming up empty-handed. That was both frustrating and exciting because I knew other people had to be searching for the same things and I had to get creative in coming up with Ninja Birthday Party ideas that wouldn’t cost a ton of money. 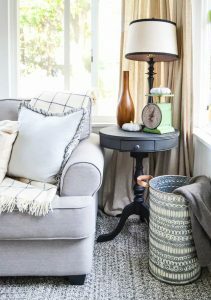 Not only was this party inexpensive, but it really wasn’t hard to put together. The first thing I did was plan for the decorations. 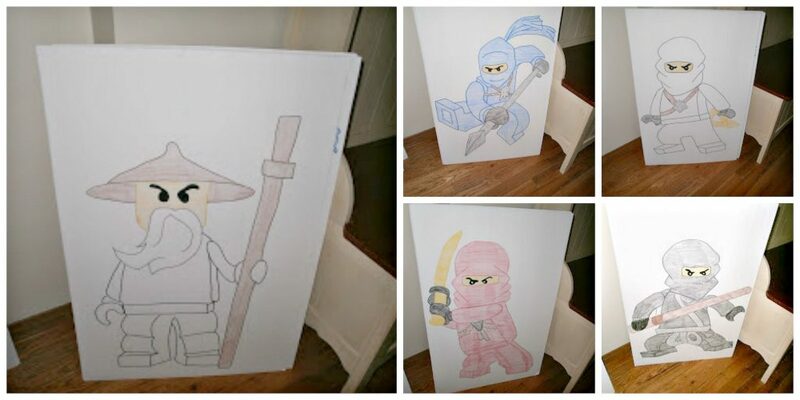 I bought some white foam board and drew pictures of our son’s favorite LEGO Ninjago characters on them. I used a projector to help me with the outline and then colored them. The foam board was pretty big so I knew these would make a BIG impression at the party. 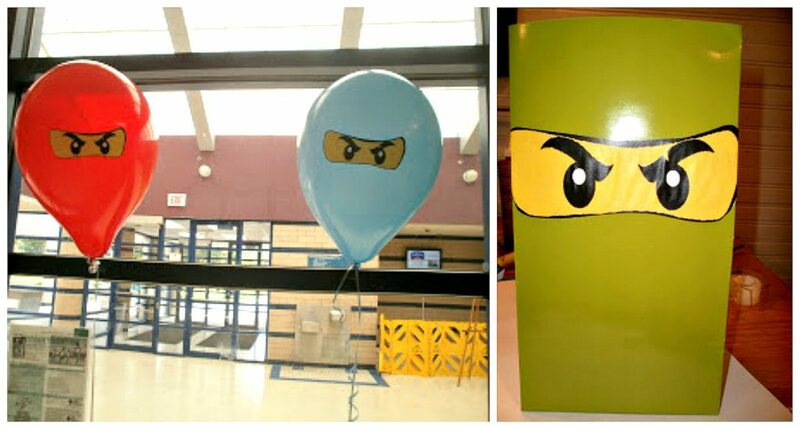 Then, we used a color printer and printed off some yellow “ninja eyes’ to add to different colored balloons. This was such a simple idea, but really brought the theme full circle. I also added the ninja eyes to the small, green take-home bags I bought bags for 25¢ at Toys R Us. If you buy smaller bags then you won’t have to fill them with a lot. BUT…. for a ninja birthday party, I had to get creative with “themed” toys for the kids to take home. I went to The Dollar Tree to see what I could come up with. I brought our son with us because he knew everything there was to know about Ninjago so he would be able to help me with different ideas. The first thing we found were “jointed” snakes that we thought were perfect to act as the “Serpentines” from the Ninjago stories. There were four in a bag for $1 so it was a very inexpensive addition to the take-home bags. We also found bags of rubber snakes that were going to be more “Serpentines” in the bags. We grabbed swirly straws because I thought they looked like snakes and then I printed off some snakes I found online to add to the straws which made them even more “serpentine-like”. After The Dollar Tree, we stopped at Michaels. There, we found foam “discs” that we thought looked like Ninja Shurikens. SCORE! To finish off the take-home bags, we wrapped Hersheys bars with green construction paper and glued the yellow eyes to the outside (I forgot to take a picture of those). When I was at Toys R Us picking up the green bags, there was an empty Ninjago display on the shelves. I asked the manager if I could have it and he said yes! This was an easy thing to add to the table to hold the ninja water bottles we made. We made and printed off a “Happy Birthday” banner! We laminated it and hung it up in the party room at my husband’s work. We also made laminated placemats for each of the guests that they could take home after the party. For ninja birthday party activities, we hired a karate instructor to show the boys some “ninja moves”. This was a huge success! They all enjoyed it! For the food, I kept it simple. I made “fushi” (fake sushi) which is rice krispie treats cut into oval shapes with a Sweedish Fish placed on top and wrapped with Fruit by the Foot Roll Ups. Easy Peasy! Instead of a cake, I made simple cupcakes. I made chocolate and white cupcakes. I frosted some blue and some green. Then, I rolled out yellow fondant and cut small ovals out of it. I took a black writing frosting tube and created the black eyes on the fondant. Then, I placed them on top of the cupcakes. 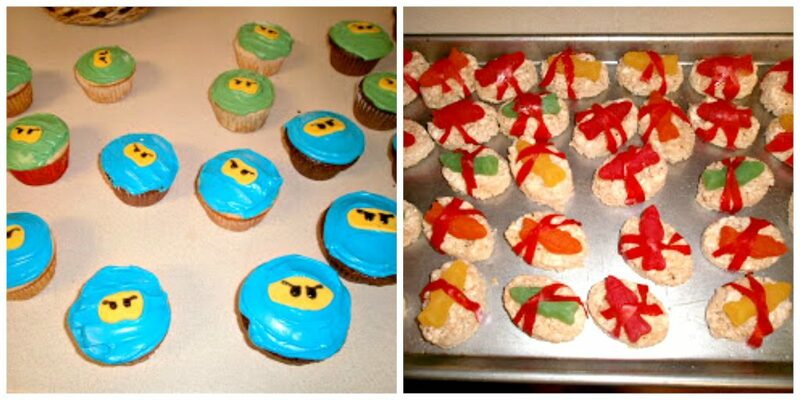 Viola – Ninja cupcakes. So easy! I also made white chocolate covered pretzels to represent the bones of Bonezai from Ninjago. All in all, this party was one of the simpler parties we have ever done. It was a lot of printing, coloring and thinking outside of the box to put it together. The kids loved it. The ninja birthday party theme was definite when people arrived and our son was so proud of it all. Our mission was accomplished. I hope some of these ideas help with your Ninja birthday party! Would u be willing to send the file for the birthday banner I have looked every where for a banner!! Please!! I don’t have that file anymore. My husband was the one that actually designed it. He found images on Google and then he put the letters on them. I hope that helps. If not, I can ask him if he can do an image and then I can send it to you. Let me know! Thanks for your comment! Can I have your file download of the Ninjago banner please? Hello I’m having a ninjago party do you mind sending me the file to the banner please I’ve been going crazy looking for something. Thank you! I hope the files I sent you help! Thanks for contacting me. I emailed you some Ninjago things. I hope they help with your party! Love all your ideas!!! My son wants to have a ninjago birthday party as well. Could you send me the file for the banner, please. Thanks! I will email some stuff to ya! Did you find the files for the banner? This will be my first time trying to make one and yours looks perfect! Thanks! Hi. I love your party! You are so talented!!! I was wondering if I could also use your files for the party decorations. Thank you! yes! I will send what I have your way! Would love to be able to use your files for my son’s 7th birthday party. Please let me know 🙂 Thank you. Hi There! 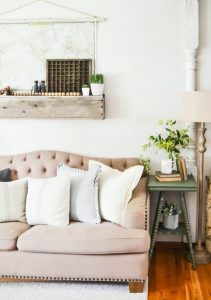 I just stumbled across this on pinterest and am loving your ideas! I am having a Ninjago party for my son, I would love to use that banner! Would you possibly be able to send that to me? Thank you!! Thanks for reaching out Kelly. I will send them your way! I will send some of the things we used to you! 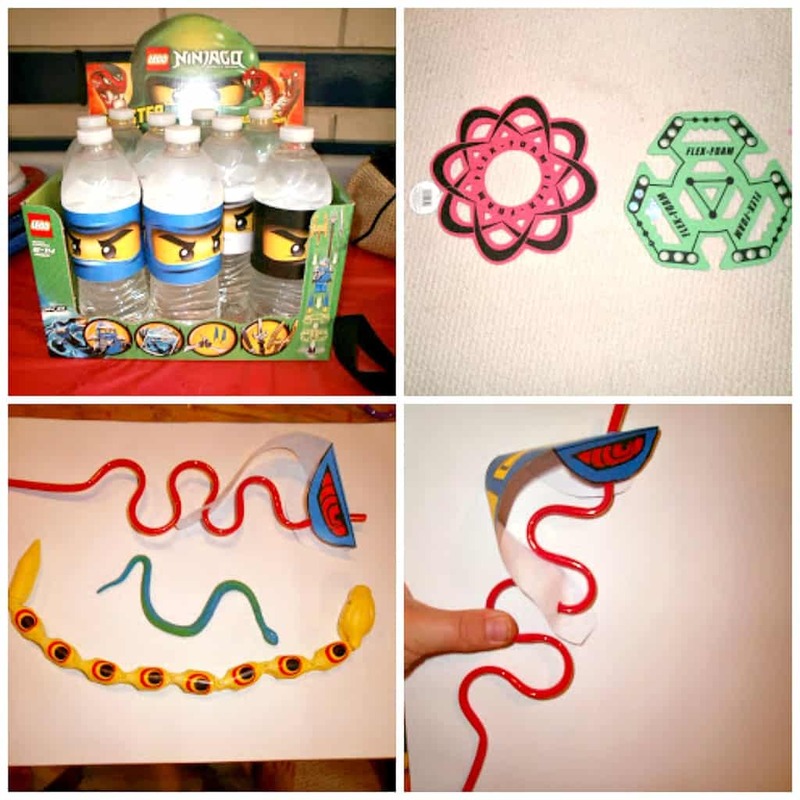 You have WONDERFUL ideas for a Lego Ninjago party. My little one also wants this as his theme. Could you send me any files that you have like the banner and eyes so I can use it too? Thank you SO MUCH! I will send them your way! Thanks for reaching out! Hello…very talented can I also bother you with the banner file as well. I see it was a popular request! I will send you what we used! Hi, I’ve come across your page on Pinterest. I’m planning my sons 5th birthday and he is ninjago mad! Would you be able to email me the bunting? Defo going to copy the balloon idea! I have emailed them to you Lelia! Happy planning! Thank you so much Lotte! I am sure Holland is beautiful. I have emailed you the Ninjago goodies! Have a great party! You and your husband are so creative! If you have the time, I would love the Ninjago files for my grandson’s upcoming birthday party. Thank you! Okay! I will send them to you! Thanks for stopping by! 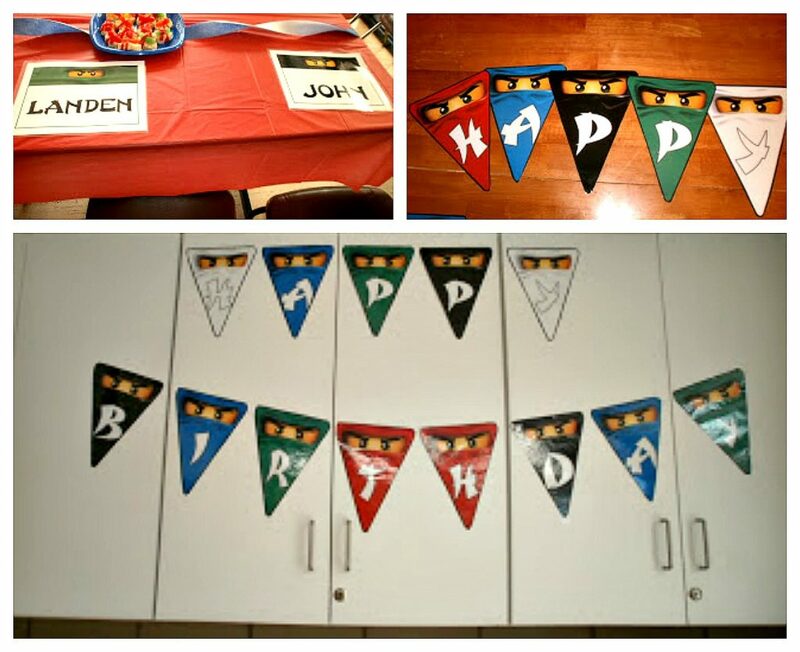 LOVE the Ninjago party ideas! I am hosting one for my twin boys’ 5th birthday this month. Would you mind sending me the banner file? Thanks so much! I will send it your way! Thanks! Love the banner! Would you please send the file so I can print it for my son’s 5th birthday party. Thanks!!!!!!!!!!!!!!!!!!! You and your husband are so creative! Would you please send the files , I would love the Ninjago files for my son’s upcoming birthday party. Thank you! I love all of your ideas! Thank you for taking the time to post them. Would you mind sending me the file as well? My nephew who is turning 5 in a few weeks loves ninjago. I think you were so creative with your party and love any help you can give. My sister and i would really appreciate it! I will send some things your way! Hello, would love if you could send me your ninjago banner file. It is amazing looking! Okay! Thanks for stopping by! Hi! I love that banner and all that you did! Looks like it was a fun party! Could you please send me a file of the banner, my son is wanting a Ninjago Party this year! Would you mind sending me the banner as well? It would save me a ton of time and headache!! Thanks in advance for your time!! Great job! Your ideas are great! My little one will be 5 in just two weeks!!! I am such a bad party planner, I am just in awe of ppl like you that can whip this stuff out! LoL Please also tell your husband that he did some great editing work on that birthday banner! 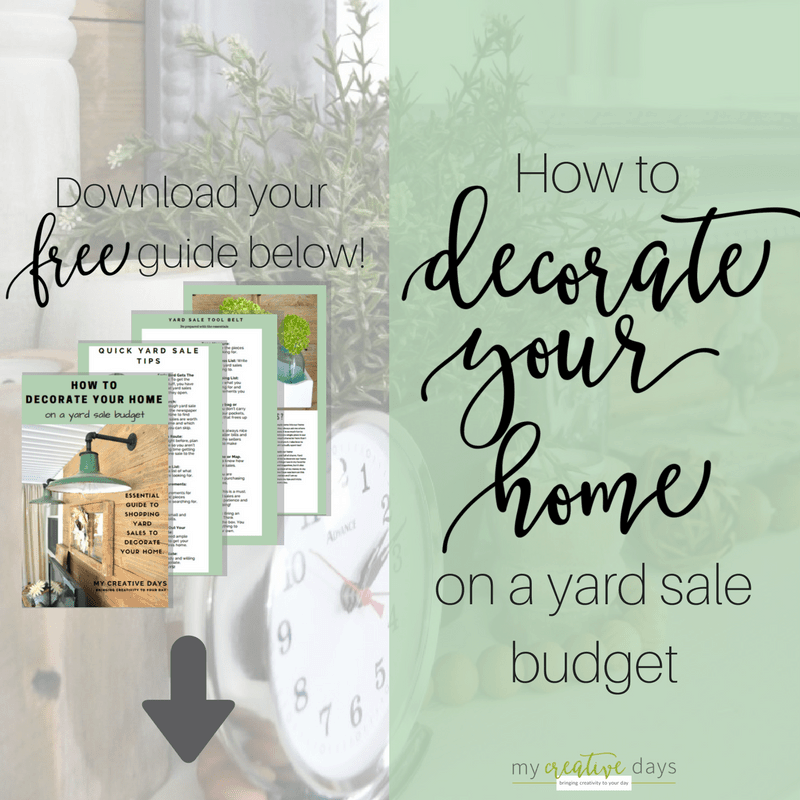 It’s easy to find other things out there as far as printables/files….But I have only seen one banner and it does not even compare to this one. I have seen the numerous requests for the file… I am sure you are both humbled by the response… I too have to ask if you wouldn’t mind passing on that file for the banner. Please know , as the compliments are sure to come, that I will NOT take creative credit for this as I can only imagine the work and love that was put into making it. Thanks so much!!! Thanks for stopping by! I have sent some of the things we used at my son’s party! 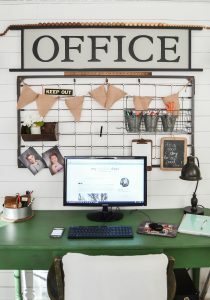 Hi I love all your ideas, if you have the printable suff available I would love to use it! My boys are turning 7 and want a Ninjago birthday. I will send it over. Thanks! Absolutely LOVE the banner!! Would you please be so kind to send the file so I can print it for my son’s birthday party. You are such a blessing, THANK YOU!! I am sending it over! Thanks! Okay. I will send them your way! Thanks! I didn’t rreceive The files, would you mind sending it again! I didn’t rreceive The files, would you mind sending it again! 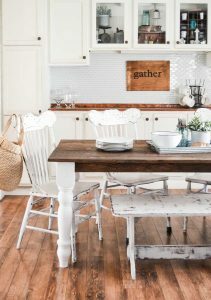 Could you also include the place mats? ! Thanks so much! I sent them over! Happy Planning! Could I have the file with the birthday banner? Thanks! I was wondering if you can please share with us whatever you have of from the Ninjago theme. We are planning my son’s 9th birthday party and love all of your ideas. THIS IS AMAZING!!! I TOO WOULD LIKE THE FILE FOR THE BANNER IF POSSIBLE? Can you send me the banner as well? It is awesome! Can you send me the banner? It is awesome!! Hi, my son changed his mind from wannting to go to the indoor playground into a Ninjago party at home 🙂 in less than two weeks so the pressure is on. Luckily my father is a karate instructor. It would be great if you could send me the banner that would save me a lot of time! I can’t find any party stuff in stores here. I would certainly appreciate if you co0uld send me the banner. Awesome party and well done. hi linsey, i am planning my son´s 5th birthday party, he is total in love with ninjas. the banners look really great , can i use them for the party? would really appreciate if you can send the file to me. Hi! My son is so into Kai… I saw your awesome pictures and I was hoping if you don’t mind…to request a copy of the banner and the placemats… Thank you so much…..
Wow I’d live to have some of your creativity just like the many other visitors here. My son is also begging for a ninjago party so I’m begging you for your files! Hello love all your ideas!! My son is dying for a ninjago party. Could you please share the birthday banner. I let my son pick out a banner image he liked for his party and his favourite was yours. Could I please get a copy of your very popular banner file. Thanks so much. I am trying to find the files. I have switched computers and my old computer does not want to cooperate. I switched computers and am having a hard time finding the files. I am so sorry. Need to take that out of the post. You did a fantastic job and explained all you did so clearly. Could I possibly get the file for the banner? I switched computers and lost the files. I am so sorry. Love your ideas!! Any luck finding your files? I would love the banner file. I don’t have them anymore. I have switched computers and it got lost in the mix. I am so sorry! may I also have the darling Birthday banner file as well? Thank you for sharing! I don’t have it anymore. I am so sorry. Such a cute party! Awesome banner! Can you please send me the banner file? Thanks you! I am sorry. I don’t have them anymore. It has been so many years and after I got my last computer, I lost them. brilliant theme love it. I see you havent got the banner file anymore. But can you tell me how your husband found the ninjago style letters please? Thanks. It was so long ago, he is not sure how he did it. I am sorry. Hi there- I know this is an old post of yours but I love your ideas and my son wants a ninjago bday party this summer. If you still have any files you would be willing to share I would so appreciate it! I work full time so trying to start planning now for a late July bday party! I am so sorry, but I don’t have them anymore. I switched computers long ago and the files got lost.